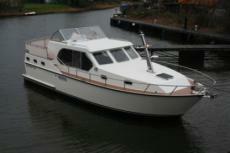 NB: Due to exceptional sales this year, good quality boats wanted for brokerage. All craft vetted and assessed by myself. Succes 145 Even longer Starting in 2009, the fourth ship in the series, the Succes 145, was restyled. Succes 135 Form and lines The distinctive form, lines and function of Succes Yachts are also visible in this Succes 135. 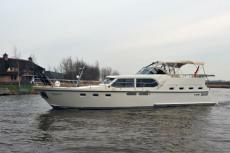 Starting in 2009, the fourth model in the series of Succes Yachts was restyled. The restyling was carried through to the lineation. The interior was also completely renovated and modernised. An updated classic. 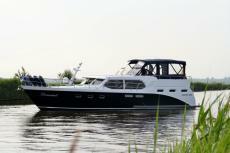 Succes 125 Spacious and easy The Succes 125 is fitted with wide gangways and an enormous afterdeck, with an integrated aft couch. A popular option is the extended swimming platform, making it easier to climb aboard. Down to the details The Succes 125 also has lots of interesting details. From the water, note the designer bollards on stainless steel plating (screwed onto the hull) and the stainless steel buffer strip on the side. Elegant The Succes 115 radiates elegance and class with her length and stylish design and perfectly harmonised proportions. The ship was completely restyled in 2008; the biggest changes concern the rounded forms on the exterior and the new, modern escutcheon. The interior of this Succes also underwent a thorough makeover. The customer has a say This ship has huge potential, both with regard to the interior and the technology and with regard to customer wishes. On the Succes 115, customers can fully realise their own personal preferences and ideas. Open cockpit The Succes 108 OC: the very successful model Succes 108 built with an open cockpit. This version has also proved herself a solid model over the years. At almost 11 metres long and 3.65 metres wide, the ship’s favourable dimensions enable you to take her into almost any harbour. And her superb performance and handling will have even an inexperienced skipper feeling at home on the ship in no time. The design This ship, like all Succes Yachts, has modern lines and a contemporary feel; the Succes 108 OC was completely restyled as recently as 2007. Rounder lines were added to the exterior and the interior underwent a total makeover. And that means luxurious enjoyment. 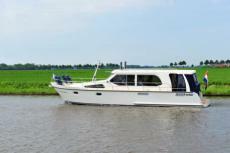 The Succes Over the years, the Succes 108 has proved herself to be a solid model. Hundreds of this model can be found sailing in the Netherlands and beyond. At nearly 11 metres long and 3.65 metres wide, the ship’s favourable dimensions enable you to take her into almost any harbour. And her superb performance and handling will have even an inexperienced skipper feeling at home on the ship in no time. The design Like all Succes Yachts, this ship has modern lines and a contemporary feel; the Succes 108 was completely restyled as recently as 2007. Rounder lines were added to the exterior and the interior has been completely refurbished. Enjoy the luxury, on the water, in style. Extremely good price In the design of the Succes 106 was paid particular attention to the price-performance ratio. On board you will find all you need to be able to maneuver and navigate a vessel of 10.60 m like this. It has been deliberately left out extras to ensure an attractive price. Neverthless, you will find an extremely well-used room design and best material. Succes GTS Unrivalled In all her beauty, the Succes GTS complements your personal lifestyle. You design and decorate this designer yacht exactly how you want it. Your water dreams are fulfilled in this Succes GTS. In this case, GTS stands for Grand Tour Sport, as in motor racing. Breathtaking to see. Striking to be seen on it. No traditional ship can compare. Unique form Where angularity has long dominated the waters, Succes GTS has opted for a strikingly modern design: stylishly graceful, curving lines and tastefully matching colours. The beautifully thought-out design complements the secure strength of steel and other durable materials. This ship catches the eye. And that’s no bad thing. At Jachtbouw2000, our decades of experience with Succes Yachts qualify us to market the best motor yachts on the Dutch and European markets. The designs and finishes are solid, beautifully thought-out and modern. But what really stands out is the excellent price/quality ratio. Even after many enjoyable years on the water, the branded ships from our shipyard retain a good market value. 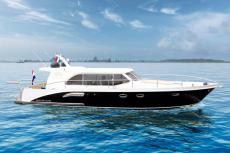 The Vri-Jon Supreme 36' is new, exceptional and innovative. 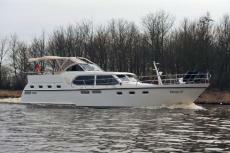 A powerfully built motor cruiser with semi-open wheelhouse. The afterdeck and living space in the cruiser are almost on an equal level. As a result you are not inconvenienced by awkward steps, while you do have the benefit of aft accommodation with two berths. From the outside wheel position you have a clear view of the whole vessel and its near surroundings. 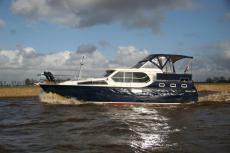 The semi-open wheelhouse design means the vessel is ideal for people who prize comfort and comfortable surroundings. A spacious bench can be integrated in the stern guardrail. You are then perfectly sheltered, with loose seats becoming a thing of the past! 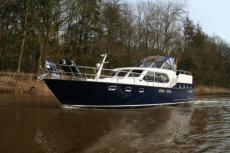 The vessel is fitted with two 33 hp engines as standard.